British doctors are debating whether it is ethical to start clinical trials to allow voice box transplantation. The task force has been set up as developments in stem cell technology make the development a possibility. A team of scientists believe they may be able to transplant a voice box in such a way that the patient would not need to take anti-rejection drugs. Each year around 1,000 patients in the UK will lose their voice box - the larynx - because of cancer or trauma. The larynx creates and controls sound through muscle and cartilage interacting with the vocal cords. 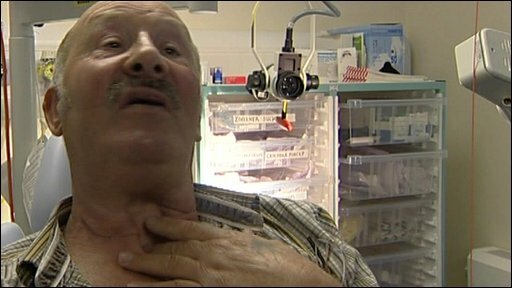 But when it is removed - in a procedure known as a laryngectomy - the patient is left with a permanent breathing hole in their neck. The difficulty of restoring the complicated nerve and muscle functions has, to date, been beyond surgery. So the only option to them is to have an artificial voice, either through a vibrating machine they put on their throat, or placing a small device in a permanent breathing hole in their neck which is activated by putting their finger over the hole. Tom Foot, from Weston-Super-Mare, uses this technique to talk. He lost his voice box because he used to smoke. He said: "The easiest part was recovering from the surgery. "The most difficult bit is getting used to not being able to have meaningful conversations - and that it was a different voice, it wasn't my voice." Despite years of research, there has only ever been one voice box transplant in the US, and the patient still needed to breathe through a hole in his neck. But now there is the possibility that improved stem cell technology could make it a possibility to develop a voice box for transplantation. A similar technique was used last year to give Claudia Castillo an artificial windpipe. She was given a donated organ which was covered with her own stem cells to trick her body into thinking the organ was part of her. She can now live a normal life without having to take powerful anti-rejection drugs. The international scientists behind the new project are now applying for funding to try to do the same thing with voice boxes. One of the team, Professor Anthony Hollander, from Bristol University, said they faced a big challenge. He said: "In addition to windpipe tissue which will have to be created - the cartilage and the epithelium - we also have to create muscle because the voice box is a moving part and needs to move in co-ordination with breathing. "We don't yet have a good way of taking stem cells and creating muscle and we need to figure out exactly how to do that and then how to implant that muscle and have it co-ordinate with the moving voice box." The Royal College of Surgeons is about to debate these technical challenges, the potential benefits of such surgery and ethical dilemmas they throw up. For instance, since these are not a life-saving procedures, do the benefits outweigh the significant risks of harm from surgery? Among the members of the task force is Professor Martin Birchall, from University College London, who led the team on the windpipe transplant. He said: "We, as a task force, have to ask ourselves whether we are finally entering the right window where a marriage of technology and of need mandates that we can go forward with this procedure. "Before now, the prevailing view has been that the balance has been strongly in favour of not going ahead. "But we feel there have been sufficient technological advances to make us seriously revisit the case for developing and making routine this procedure. "We have to ask ourselves is it right to subject a patient to the risks of surgery for a procedure which is not life-saving." 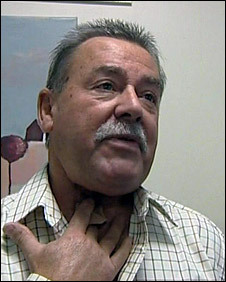 Another patient who lost his voice box, Dave Williams from Bristol, would welcome a transplant. He said he often has to come into hospital because of complications from his implant. Mr Williams said: "What people don't realise is when they have this operation there are a few things you can't do - one thing is smell, another is swim, and another is shout." The pan-European team that has developed the stem cell technique should find out by April whether they have secured the 6m euros they need for the project to begin. If they get the go-ahead, then laboratory work should start this year.